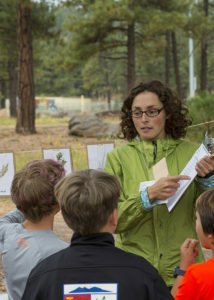 Chelsea explains how to fill out a plant data collection sheet during a BioBlitz at Frances Short Pond, September 2016. What an exciting year I’ve had as an AmeriCorps STEM VISTA member with Friends of the Rio de Flag working with Flagstaff schoolchildren and teachers. Our local stream, the Rio de Flag, is the biological heart of our community and flows through most neighborhoods. The Rio is a great outdoor classroom for the sevens schools that I worked with when they joined our new Adopt-the-Rio de Flag Stewardship program. I’d love your support to continue for another year as a STEM VISTA member, building on the success of the Adopt-the-Rio program and developing a new program for citizen science, which will ask for community volunteers to monitor and collect environmental data along the Rio. My goal is to inspire a lifelong stewardship of the Rio’s remarkable educational, recreational, and biological resources. The Friends of the Rio de Flag needs to raise $3,500 in matching funds so we can again be a Project Host Site for my position, and we’d like to raise an additional $1,000 for materials to be used in these projects for a total of $4,500. Please help reach our goal of $4,500 by Earth Day on April 22nd! Donate today and make sure to “Share” our GoFundMe project on your Facebook! Follow us on Facebook during our fundraising campaign to discover something new about the Rio and our watershed every day!